What it’s about: The circus arrives without warning. It opens at nightfall and closes at dawn. You enter through a star-filled tent, only to find yourself in a black-and-white world of acrobats and jugglers, labyrinths and ice gardens, a bonfire burning white and the scent of caramel and popcorn in the air. It is Le Cirque des Rêves, the circus of dreams, and it delights patrons around the globe with tattooed contortionists, fortune tellers, and a lovely young illusionist by the name of Celia Bowen. What few people know if that Le Cirque des Rêves is merely a venue for a magical competition, two student magicians bound by rules that neither of them fully understand. Celia was bound by her father, the great illusionist Prospero, who endlessly drilled his child to shatter and fix teacups or pull birds from the air. The opponent in the game is chosen by Prospero’s longtime rival, the man in the gray suit. He selects an orphan boy, Marco, who studies ancient symbols and signs. While Celia’s education is visceral, Marco’s is cerebral. The final battle is to be a test of philosophy and much as it is skill. But to Celia and Marco, this test is so much more. It’s their entire existence. They’ve never known anything but the coming challenge, the mark burned into their fingers that signifies the bond. And after years of training and study it’s finally come in the form of something delightful. They each find themselves falling in love with the circus, challenging themselves to create more wonderful attractions and deepen its mystery, only to find that while they are supposed to be competing they are unquestionably also drawn to one another. 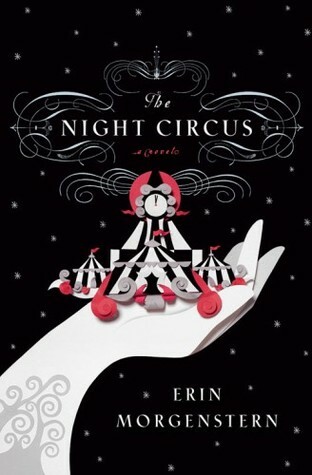 The Night Circus is one of the best books I’ve read all year and I’ll add it to my list of all-time favorites. What appealed to me most was the absolutely mind-consuming beauty of the narrative. I left this book with a deep, deep longing to visit The Night Circus, as if Morgenstern had pulled a hidden place from my mind and breathed life into a dream I’d always carried. The circus is almost supernatural in its pull. The story is magic, mystery, intrigue, and romance all at once. It reminded me a bit of Jonathan Strange and Mr. Norrell in terms of language and atmosphere, but it doesn’t have the density of that book and it adds desire. The Night Circus is written in a series of vignettes or scenes, which really adds to the mystery and otherworldly or dreamlike feeling. Morgenstern is able to craft striking, almost haunting images that stay with you long after you close the book. I flew through it. Would I recommend? Most certainly! What a stunning debut! I may find it hard to forgive Ms. Morgenstern for instilling such a burning hope that the Night Circus exists, but I’ll certainly pick up her next book (and read this one again!). I’ve been curious about this one since I first heard of it a couple months ago. I’ll have to check it out! I had read a couple other reviews of this and thought I wasn’t interested but your review has made me do an about face. I’m going to go add it to my Goodreads queue right now! Thanks. Thanks Jessica! I’m so glad my review helped! Let me know what you think after you read.